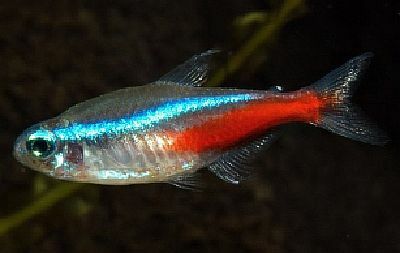 Tag Archive | "Jewels Of Tropical Fish Keepers"
The diminutive Neon Tetra (Paracheirodon innesi) is frequently described as the “Jewel of the aquarium hobby” by tropical fish keeping enthusiasts for several reasons. These popular little freshwater tropical fish are adorned with beautiful iridescent colors and when kept in large schools provide a beautiful addition to any South American community tank. Neon Tetras (Paracheirodon innesi) are native to the clear water streams of South America. They have an iridescent blue body with bright red tails and when kept in schools of eight or more, create a startling splash of color to any aquarium. Neon Tetras prefer a setting similar to their natural habitat. A densely planted aquarium that has a few rocks, some driftwood nestled between the plants, some floating plants and plenty of low light areas for the fish to hide in, will keep your Neons healthy and happy. Neon Tetras have a tendency to swim or remain suspended in the water column in large schools. This trait creates a breathtakingly colorful display in any aquarium. Neons are peaceful little fish and should be housed with other similar South American tetras of the same size. They belong to the family “Characidae” and thrive in slightly acidic (pH 5.0 to 7.0) water. Neon Tetras can be successfully bred in captivity by placing a pair into a dark or dimly lit breeding tank. Increase the lighting in the tank until breeding occurs. Breeding can be induced by keeping the water hardness at less than 4 dH and providing daphnia, brine shrimp, mosquito larvae or other live foods to the spawning pair. After spawning occurs, remove the parents to their original environment. The parents will usually eat their eggs if kept in the breeding tank. The eggs usually hatch within 30 hours or so. Neon Tetras will eagerly accept many small foods such as live brine shrimp, daphnia , mosquito larvae, tubifex worms, bloodworms , freeze-dried products, micro pellets, and high quality flake foods. Vary their diet to keep them healthy and happy.